As the world’s tallest free-standing mountain (5895m / 19,341 ft), the snow-capped peak of Mt Kilimanjaro is a stunning sight that can be seen throughout the surrounding plains of East Africa. 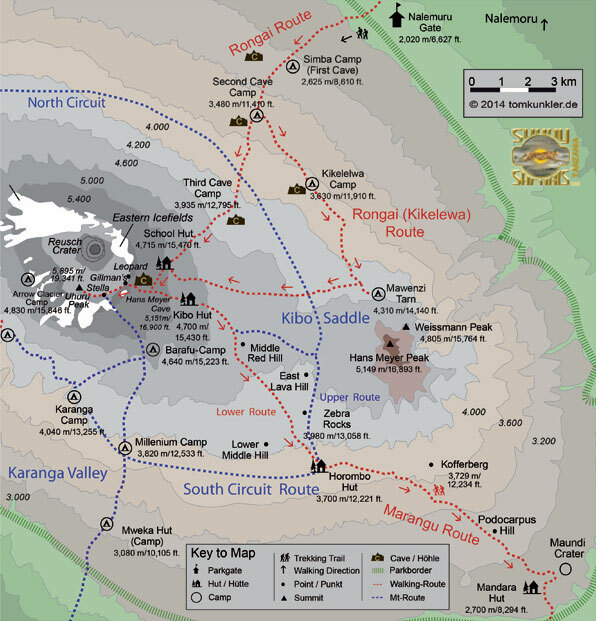 Located in Kilimanjaro National Park on the border of Tanzania and Kenya, its slopes present an ever-present challenge to adventurous mountain climbers, creating an unforgettable climbing experience. The climb takes you through the tropical cultivated farmland on the lower slopes, through a lush montane forest, where you might spot duiker, elephants, leopards or buffalos, and then out onto open moorland. 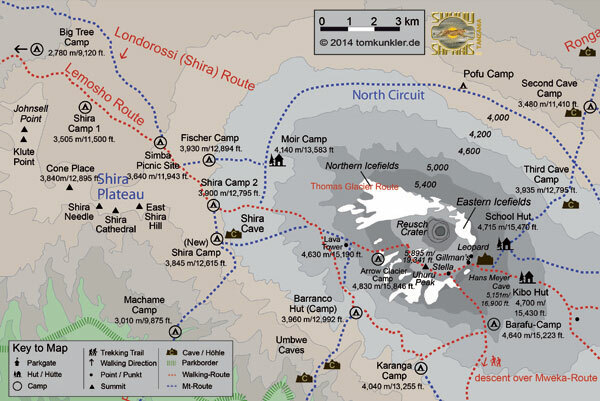 Finally, you will cross an alpine desert of mosses and lichen before reaching the snowfields at the summit. 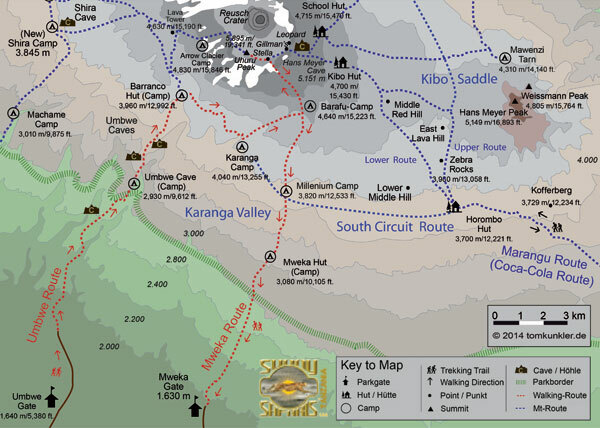 Choose one of four routes: Marangu, Machame, Rongai or Shira/Lemosho, and allow our trained mountain guides to lead you on this spectacular journey. See our route maps below. It is highly recommended that you have insurance that covers emergency evacuation 6,000 meters above Sea Level. For more information see our Search and Rescue page. A Hero Flight is an extremely fast, unique and hassle-free way to end your epic adventure after conquering Africa’s highest peak. A helicopter flight from Mt. 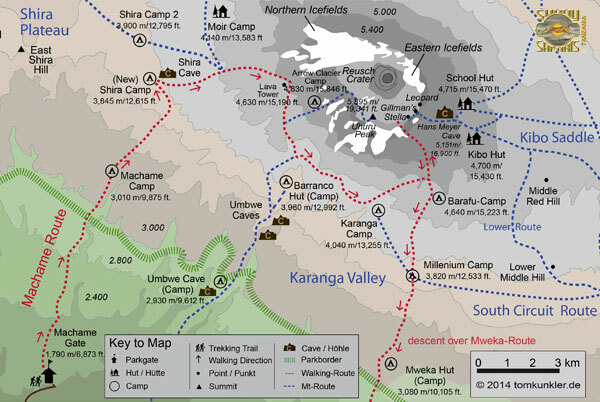 Kilimanjaro to KIA/Moshi Airport will turn your 2-day hiking descent into a helicopter flight that takes less than an hour. Reward yourself with more time to relax and a chance to explore more of Tanzania's natural wonders. Get a magnificent “birds-eye” view of nature in an exclusive and luxurious scenic helicopter flight. 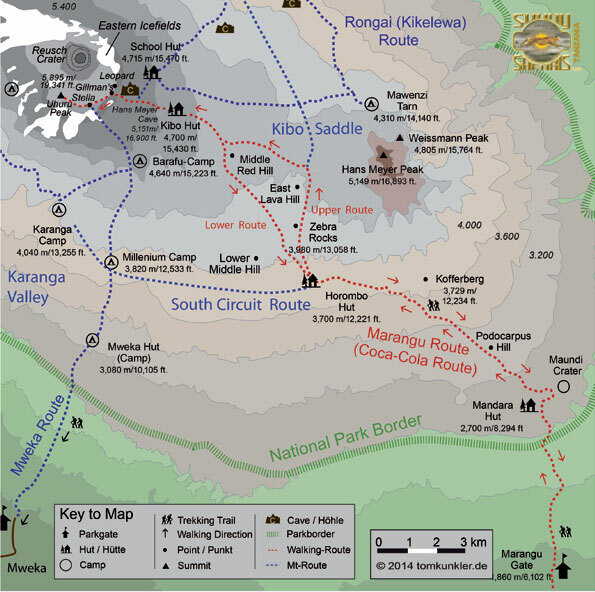 This exciting journey takes you from Moshi/KIA airport. You can witness a breathtaking view of the glacier flow on majestic Mount Kilimanjaro or fly over the famous Serengeti and its abundance of wildlife. Appreciate the beauty of Lake Natron, a soda lake filled with thousands of flamingos, at the base of the active Ol Doinyo Lengai volcano. Contact Sunny Safaris to arrange your scenic helicopter flight.